Butter had leached out of the flimsy cardboard boxes. I peeked into one and the smell of the flaky crust that cradled the delicate strips of young coconut wafted through my nose. I wanted to rip the box open and tear a clumsy piece off but I held back. Begrudgingly held back. The bakery in Los Baños, whose name escapes me, was our last stop before heading back home from a day spent in Pagsanjan, my dad’s hometown in Laguna. That was nearly fifteen years ago, the last time I had a taste of Laguna’s famous buko pies. It was a last-minute excursion, if I recall correctly. 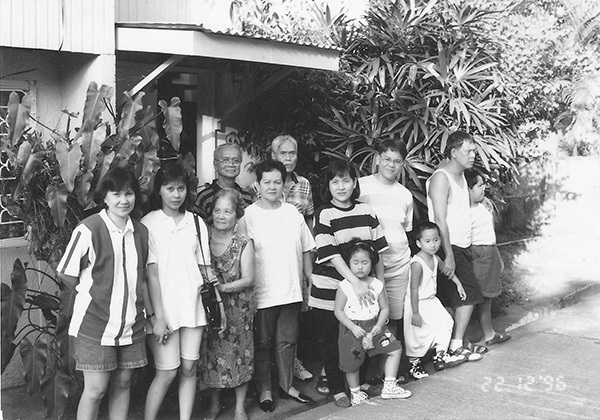 A few days before Christmas, we packed ourselves like sardines in my sister’s Toyota van and drove south of Manila to visit my Uncle Monching, my dad’s older brother, and his wife, Auntie Luz. They lived in a quaint house next to a farm lined with rambutan and mango trees and rows of chicken coops. My dad who navigated sat in front next to my brother-in-law. I sat sandwiched by my five-year-old nephew and my mom. And in some miraculous way, my three sisters and two nieces crammed themselves in the backseat next to the cooler packed with cans of Coca-Cola, Spam pan de sal sandwiches and a bounty of chichirya — salt- and sugar-laden snacks for the kids, myself included. Traffic wasn’t as bad as we expected and before long the town’s prominent stone arc greeted us. On the way to my uncle’s farm, we passed by the bridge over the Bumbungan River where local boatmen called bangkeros hanged out to wait for tourists wanting to see the majestic Pagsanjan Falls. Pagsanjan’s claim to fame is the stunning four-hundred-foot waterfalls at the end of an exhilarating boat ride along a verdant river gorge. To get to the Falls, you board a canoe called bangka and you let the bangkero drive it through a sequence of heart-pounding rapids. There are interludes of quiet, calm currents but for the most part the boat ride is not for the faint of heart. I was a young teen when my dad took me to the Falls for the first time and I still relish the thrill of shooting the rapids to this day. I wanted to take the kids to see the Falls but everyone else thought it was best to skip it. We all agreed that the boat ride would be too much for the toddlers. It was a lovely visit. Short but sweet. My Auntie Luz doted on my mom and reminisced about the good ol’ days when my sisters were little and my parents would take them to Pagsanjan on board dingy passenger buses. While my dad and Uncle Monching talked politics, the kids and I played with the roosters grazing in the farm. I don’t remember all that much about our afternoon at my uncle’s. I guess I was too fixated on those buko pies. Either that or I was too self-absorbed. Perhaps a little of both. But I do remember though how we failed miserably to have everyone look at the camera when we snapped a family portrait. As I fondly look back to that day in Pagsanjan, bittersweet images flash through my mind. My nieces serenading everyone with American pop songs. My mom and my sisters gossiping about my dad’s side of the family. My nephew sleeping next to me while clutching his favorite pillow under his chin. My dad cussing at the traffic. And my Uncle Monching and Auntie Luz waving their hands to say goodbye as our van rolled out of their driveway. Little did I know that it would be the last time I would see them. But it gives me comfort to know that I will always have buko pies to remember them by. Buko is young coconut. Its meat is tender and it’s brimming with juice. 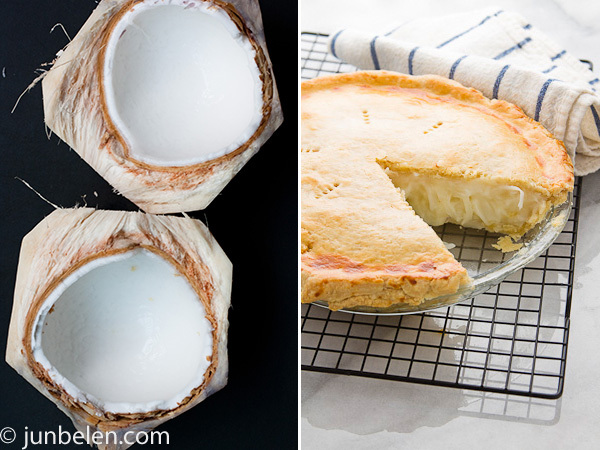 Buko pie is young coconut cream pie and the best pies come from Laguna, without a doubt. Amy Besa’s and Romy Dorotan’s version is loaded with plenty of buko and when I say plenty, I mean plenty. When making buko pies from scratch, it’s best to use fresh young coconut. However, cracking coconuts and scooping the meat out of its hard shell may be too tedious and so packaged sliced young coconuts can be used instead. These come frozen and are available in most Asian grocery stores, which should not be confused with frozen grated mature coconut. 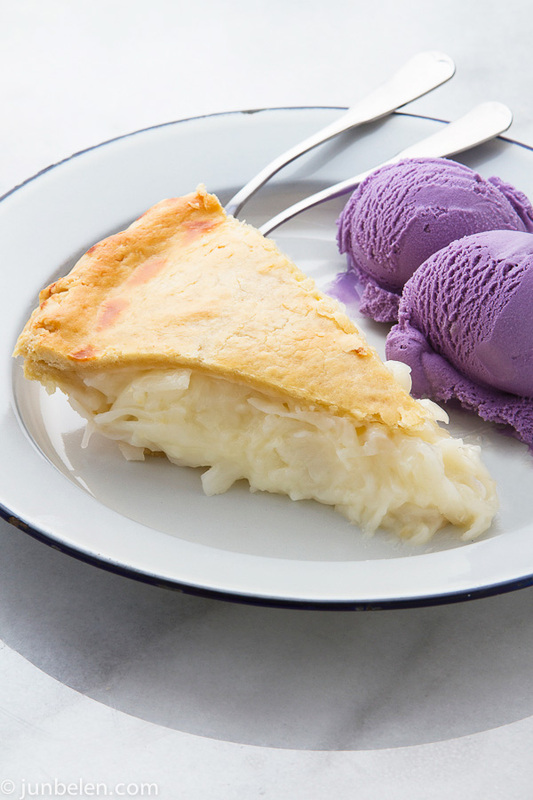 Serve a slice of warm buko pie, fresh out of the oven, with a scoop or two of ube ice cream. Place the dough out onto a clean lightly floured work surface. Divide the dough in half and pat each into a disk about half an inch thick. Wrap each disk in plastic wrap and refrigerate until firm, at least an hour or up to two days. In a small bowl, whisk together coconut juice and cornstarch until smooth. In a large saucepan over medium heat, combine the heavy cream and sugar and bring just to a simmer, stirring to dissolve the sugar, about 3 minutes. Add the coconut and bring back to a simmer, stirring. Slowly pour in the coconut juice-cornstarch mixture, stirring constantly, until thickened, about 2 minutes. Transfer to a bowl and let cool completely. Soften pie dough at room temperature. Roll out each disk of dough on a lightly floured work surface with a lightly floured rolling pin into a 12-inch circle. Line a 9-inch pie pan with the pastry, pressing the crust into the sides and bottom of the pan. Refrigerate for at least 1 hour. Pour in the cooled buko filling, spreading the filling out evenly over the crust. Fit the second dough circle on top of the pie and roll the edge of the top crust under the edge of the bottom crust, fluting the edges. In a small bowl, beat the egg yolk with the milk to make the egg wash. Brush the top of the pie with the egg wash. Using a kitchen fork or a paring knife, prick 6 vent holes in the top of the pie. Place the pie on a baking sheet and bake for 15 minutes, then lower the oven temperature to 350 degrees F and bake until the crust is golden brown, 30 to 40 minutes. Cool on a wire rack before serving. Wow, I need this pie in my life! Your story resonates so much with me. I took my (non-Filipino) husband to the Philippines for the first time 11 years ago. We came back with 5 buko pies. This past Christmas, we took our kids (6 & 8 years), and the one of the most important things my husband wanted them to experience was buko pie. It was worth the 4 hours traffic– one way. We ate a couple pies on our way to the airport. Our SF foodie friends who got to try some couldn’t get enough either. Thanks for the recipe! I’m excited to attempt this at home. Hi Jun! I made your buko pie yesterday, it was an instant hit! It was really scrumptious and easy to make. Thank you for sharing the recipe and for the beautiful photos. 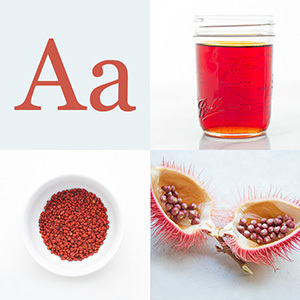 I’ve bookmarked your site and I’m coming back for more recipes :). Rina, thank you for writing back. So happy to hear you enjoyed the recipe. It’s so simple, isn’t it? Come back and try the other recipes. Maraming salamat! Thank you for the tip, Micah!